According to recent legend, Niviane's name was suggested by original, but now departed, guitarist Claudeous Creamer, from the song Tears Of Niviane by the now defunct Serpent & Seraph, of which he was a member. But I wonder something else. Did the band members know that Niviane is one of the many literary variations for Arthur legend's Lady of the Lake, ruler of Avalon and the one who gave Arthur his sword? Huh? But moving along. From Sacramento, Niviane was founded by Creamer and guitarist Mark Miner back in 2014. Personnel changed over the next few years, but finally stabilized with guitarist Gary Tarplee, bassist Rick Stallkamp, drummer Noe Luna (Skinner, 3 Lunas), and well-known Bay Area metal vocalist Norman Skinner (Imagika, Skinner, Hellscream). They drop their first album, The Druid King, and describe their brand of heavy metal as a "new breed of American power metal." I'm not sure how true that last statement may be as only time well tell. 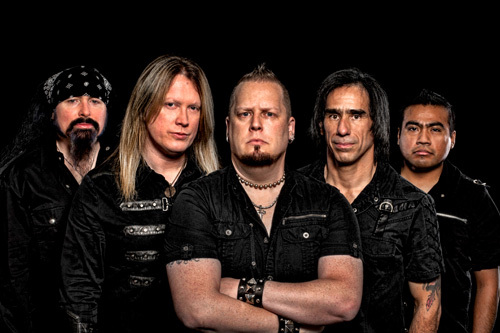 What can be said is that Niviane offers some creative and exciting melodic power metal. Think a merger European power metal with the American side of the New Wave of British Heavy Metal. The fundamentals are here: twin guitar harmony in riffs and leads, a solid rhythm section that delivers both groove and traditional power metal gallop, and some versatile, mostly melodic and clean, vocals from Norman Skinner. Perhaps what stands out most is the first and third of those elements. Mark Miner is quite the accomplished guitarist, and his day job is teaching a host of promising upstart Bay Area guitarists. (Even fellow band guitarist Gary Tarplee considers him a mentor.) I'm thinking he also might be responsible for the depth and breadth of the songwriting. Besides being loaded with lots of heavy and sharp riffs, those same riffs and the leads are blessed with layers of melody, harmony, and groove. And I think that hard rock groove is from the traditional American metal edge. Additionally, the arrangements aren't singular and redundant in composition. Tempos vary, as does the degree of heaviness and the vocal arrangements, which leads us to that third element. When I first got wind of Niviane, from an earlier press release, and saw that Norman Skinner was the vocalist, I was more than a little skeptical, even skittish, about what to expect. I remembered his screamo vocals from his work with Dire Peril, which I did not enjoy. Of course then, that's what I expected here. But as I mentioned earlier, I was surprised to find Skinner to be quite the versatile vocalist. He can go from a milder voice (within Watch The Banners Fall and Elegy) to full metal screamo in the best sense (The Berserker, Heaven Overflow) to a more minimalist metal growling (Gladiator, Arise Samurai). Essentially, what Skinner does is mold his voice to the song arrangements, especially the tone of the guitars and the subject of the lyrics. But if I had to make a choice between the two, the best part of Niviane and The Druid King is definitely the strong song composition and the powerful guitar lines. The former makes every song different and compelling; there's not a runt in the litter. As for the latter, well, let's just say, if you like guitar-forward heavy metal, you will dig this album. 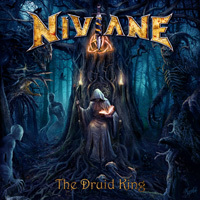 Niviane's The Druid King is a fine first effort, offering creative and compelling American melodic power metal. Easily recommended. The best part of Niviane and The Druid King is the strong song composition and the powerful guitar lines. The former makes every song different and compelling; there's not a runt in the litter. As for the latter, well, let's just say, if you like guitar-forward heavy metal, you will dig this album. Easily recommended.